When you walk around Great Britain you may enjoy the beauty of the green fields and the wonderfully maintained public footpaths. But, if you spend enough time in the outdoors, hiking, running, biking, you may have more than one painful run-in with the wild, spiny dragon known as Stinging Nettle. I am a hiker and, though I am also an herbalist, I still can say that I truly HATE this herb. I wish that all the Stinging Nettle in Britain would shrivel up and die. At least, that is how I feel when I am exploring the wilds (especially at night, when you can’t see the stuff.) But when I am feeling under the weather, that nettle tea begins calling my name and, after I have drunk a cup or two, I am singing its praises on high! 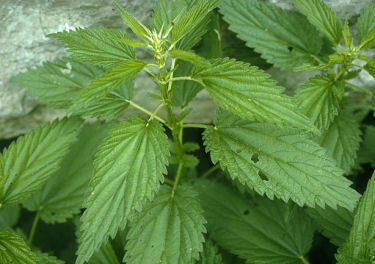 Stinging Nettle, scientifically known as Urtica Dioica, grows wild in most temperate areas of the northern hemisphere, grows on stems that can reach six feet in height, has numerous toothed leaves that grow precisely opposite each other on the stem and have visible stingy hairs on the leaf surface. Nettle usually grows in large, spreading clumps, in untended field boundaries, abandoned lots and on roadsides. If a leaf is even gently brushed by human skin will instantly produce a sharp, burning sting. This sensation is usually followed by redness, swelling and eventually numbness, which lasts anywhere from 15 minutes to more than an hour. This is the feature which makes nettle so unpopular with outdoorsmen. Nettle however is quite medicinal and can also be cooked and eaten, quite safely and with numerous health benefits. Nettle’s main functions are immune-supporting and digestive, including a reduction of inflammation, cleansing of toxins from the blood, an increase in healthy urination, anti-nausea, ease for indigestion, dilation of blood vessels, treatment for anaemia and much more. These activities combined make nettle a very powerful, yet gentle, body cleanser. Not only does nettle remove toxins from the body, it is also used as nourishment for those with weak constitution. Nettle broth (ie. nettle tea) is often given to women and babies who have been through a rough birth or to people recovering from cancer who have problems with nausea. Nettle can be eaten and used the same way that one would use cooked spinach leaves. It should be exposed to boiling water only for 10-30 seconds and never for more than 60, if benefits are to be retained. Ten seconds is enough to removing the stinging property form leaves. Roots are also used medicinally. I recently had an encounter with poisonous mushrooms, while out exploring nature, having touched and held one that was highly toxic. The effects hit me within just a few minutes. As I arrived home, I felt dizzy, weak and nauseous as well as having blurry vision. But after a glass of water and two cups of nettle tea I was relieved and refreshed. Nettle is a wonderful healing agent! Even the gourmet vegetarian cook can give Nettle a try at home, just remember that, when gathering Nettle in the wild or from your local Farmer’s market, you should always wear thick gloves of either rubber or leather. An interesting, and even more unknown, fact about nettle is that it can be used to produce fabric. Nettle contains fibrous material much like another sustainable clothing fabric, hemp. Hemp clothes are becoming more and more popular nowadays as we all grow in our awareness of the effect that human consumption has upon the Earth’s natural resources. Being frugal does not simply mean being more guarded about how you spend your own money but about how you spend the vital resources of the planet as well. It would be interesting to see the demand for nettle increase and the demand for lycra decrease. Some students in England have recently completed a project which involved the design of clothing made from Nettle fibre and the results were quite wonderful. There is also a German has recently revived the ancient technique for producing fine and coarse cloths from Stinging Nettle, he sells his products, which include sheets and pillowcases, on the German language website Nettle World. If you are looking for something new to add to your plate or your frugal medicine cabinet, I think nettle should be it! Nettles are a great source of calcium and greens. We also forage dandelion greens and heads from the yard. They are nutritious and delicious!